1/ Mix the saffron, thyme, rosemary, salt, pepper and orange zest in a bowl. 2/ Coat the chicken with olive oil and sprinkle generously with the spice mixture. 3/ Put the entire orange into the chicken cavity. 4/ Place the chicken in a platter with the orange juice and parsley. Let marinade for 4 hours. 5/ Program the application to the “Chicken” setting and insert the meat°it probe into the thickest part of the chicken breast. 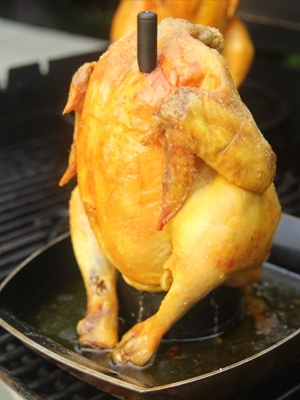 6/ Either on a barbecue rotisserie or in an oven heated to 350°F/180°C, cook the chicken until the probe sounds (165°F/74°C). 7/ When application sounds alert at the end of cooking time, program it for 10 standing time and cover the chicken with aluminum foil.